Congresswoman has been losing vision in her eyes as a result of brain injury. 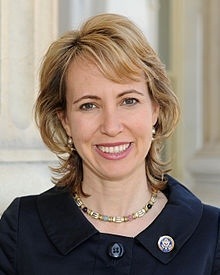 Arizona Congresswoman Gabrielle Giffords is stepping down this week. A brain injury she suffered from a shooting nearly a year ago in Arizona has been affecting her day to day duties in Congress. She has lost 50% of her vision in both eyes. Gunman Jared Loughner shot Giffords in the head at a political rally in Tucson Arizona a year ago. He also shot and killed six other people including a six year old girl that were there to hear Giffords speak. More would have died if a bystander wouldn’t have smacked Loughner in the back of the head with a folding chair while he was trying to reload his pistol. Loughner has been deemed mentally incompetent to stand trial but if convicted and found guilty of murder could face the death penalty. Giffords plans to go back to Tucson to shake hands and finish the meet in greet that was in progress when she was shot.